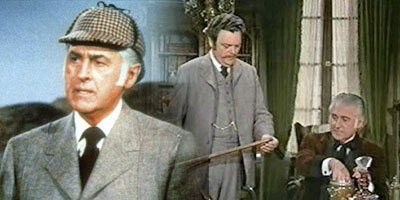 I am told by a trusted colleague that he considers this the worst Holmes movie ever made. I respectfully disagree and have previously in this blog given my opinion of the worst Holmes film around. For some reason though, both happen to be made for TV movies of our favorite characters. The Hound of the Baskervilles with Stewart Granger in the role of Holmes was made for TV in 1972 and is not readily available except through some classic movie sites. The problem with the film is not really the actors; in fact, the role of accomplished actors is quite good; the problem is the production quality. It’s as if they had a budget of about $1.95 and decided to see how far they could stretch it. Everything from poorly painted scenery to plastic moor plants were used. As I said, the array of actors was pretty good: Stewart Granger as Holmes, Bernard Fox as Watson, William Shatner (in a non-Star Trek role) as Stapleton, and Anthony Zerbe as Dr. Mortimer. Not a bad cast. The script varies from the original story but is interesting. Granger’s performance is adequate, and Shatner is interesting but his role is somewhat limited. Zerbe is great as an evil Mortimer and Fox does a decent job with the part of Watson. Fox is neither the buffoon nor a rocket scientist and interestingly enough, at the end of the film hints at more stories to come. This was obviously a pilot that suffered from inadequate funding. All in all, I guess it’s worth the 72 minutes of run time just to see another variation on the Hound. All in all, Fox has had a great career as a character actor and does a fair job with Watson under poor conditions. 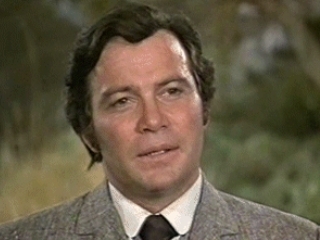 Was Shatner ever any good in ANY role he played??? Not a fan are we? How can anyone be a “fan” of someone who is so abjectly awful? To be fair, he was a tad more bearable as Fat Shatner in the last “Star Trek” movies…and, the writers were merciful and FINALLY killed him off. And, he was mildly amusing at a Trekcon my wife dragged me to. I’m just surprised that this man’s immense ego didn’t cause his head to explode. And: did you ever hear his gawd-awful rendition of “Lucy In The Sky With Diamonds”? As one who has the complete collection of Holmes stories and has read each…lovingly…many times over, I think that Jeremy Brett and Edward Hardwicke were absolutely the BEST Holmes/ Watson team ever. I’m only sorry that Mr. Brett died before the BBC produced the rest of the episodes.